TripAdvisor®, the world’s largest travel website, announces the winner of the Travelers‘ Choice Family Hotel Award 2012. This year, 504 accommodation facilities especially popular with families in 25 regions around the globe have been awarded prizes. And Travelers‘ Choice Awards are based solely on the reviews of hotel guests that were submitted on TripAdvisor. “This ranking not only includes classic family hotels, but also hotels that stand out due to their individual features – be it extensive leisure activities, great food or their medieval charm. The user reviews show that parents and children feel equally at home when the overall concept is conclusive,” summarizes Pia Schratzenstaller, spokeswoman of TripAdvisor in Germany. Germany’s most family friendly hotel is in the Allgäu! 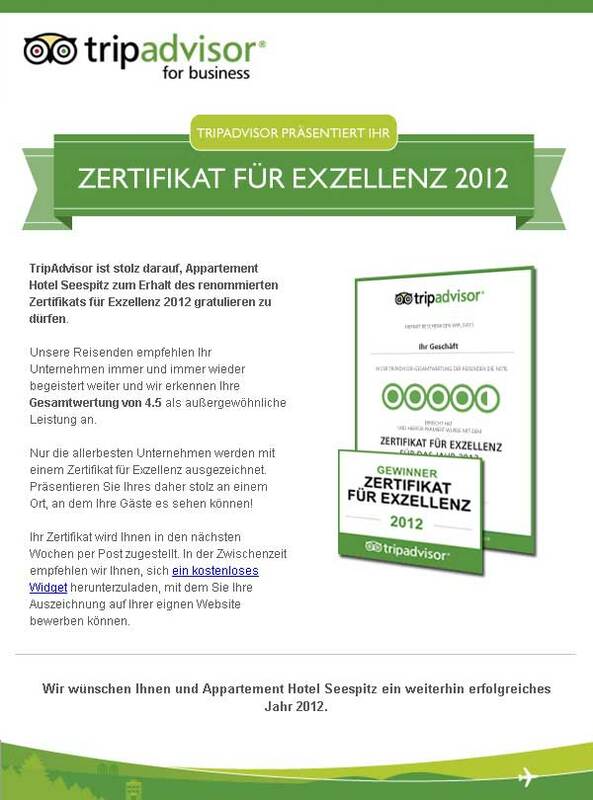 The number one family friendly hotel in the TripAdvisor Ranking in Germany is the Seespitz Apartment Hotel in the Allgäu. According to the reviews on TripAdvisor, the winner not only convinces with its location on Lake Weissensee, in the middle of a recreation area, but also with child friendly staff, family activities such as sports and creative programs as well as a relaxed atmosphere. “I am very happy about this award from TripAdvisor that represents the satisfaction of our guests. It is my personal and our entire team’s highest priority to constantly meet the demands of our guest of all ages. Our guest enjoy the perfect family fun not only in our hotel, but also outside when they are skiing in the spring sun during the Easter vacations or biking with the whole family in the summer. Winning the TC Family Hotel Award shows that we are heading in the right direction with our philosophy,” adds Wilhelm Häussler, owner of the Seespitz Apartment Hotel.